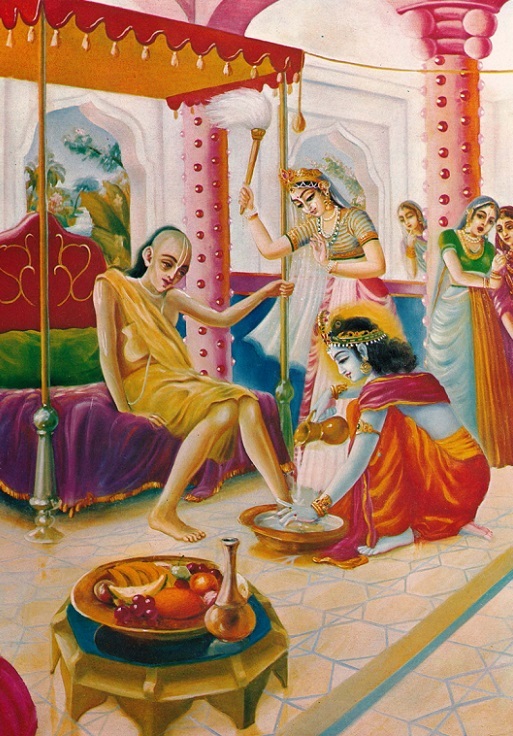 "Kṛṣṇa continued to talk with His brāhmaṇa friend: 'My dear friend, I think you remember our activities during the days when we were living as students. You may remember that once we went to collect fuel from the forest on the order of the guru's wife. While we were collecting the dried wood, we by chance entered the dense forest and became lost. There was an unexpected dust storm and then clouds and lightning in the sky and the explosive sound of thunder. Then sunset came, and we were lost in the dark jungle. After this, there was severe rainfall; the whole ground was overflooded with water, and we could not trace out the way to return to our guru's āśrama. You may remember that the heavy rainfall—it was not actually rainfall but a sort of devastation. On account of the dust storm and the heavy rain, we began to feel greatly pained, and in whichever direction we turned we were bewildered. In that distressed condition, we took each other's hand and tried to find our way out. We passed the whole night in that way, and early in the morning when our absence became known to our gurudeva, he sent his other disciples to search us out. He also came with them, and when they reached us in the jungle they found us to be very distressed. Kṛṣṇa continued: 'My dear friend, you may remember that many such incidents occurred while we were in the āśrama of our spiritual master. Both of us can realize that without the blessings of the spiritual master no one can be happy. By the mercy of the spiritual master and by his blessings, one can achieve peace and prosperity and be able to fulfill the mission of human life.' "